It's only one week to HHC 2018, the annual HP calculator conference. This year's conference will be in San Jose, California. As always I am excited. The following program, written by Stefanescu Horatiu, calculates the intersection point of the two diagonals of a quadrilateral (partulator in Romanian). The program takes place in a directory PATRULATERDIAGONALE. In order to type in the program, you will need to create a directory by using the CRDIR command. This program also works on the HP 49G series (48gii, 49G, 49g+) and the HP 50g. Note: You are going to notice how all the subroutines flow together, as the first program calls the next program. You will need to enter and store all the programs for the entire routine to work correctly. On a personal note, I like how the text is spelled out one letter at time. Hoartiu accomplishes this by using a FOR-NEXT structure which includes the commands 1 I SUB 1 DISP. (with I as the counter variable). The text of the program is in Romanian. The program is presented here with permission from the author, with full credit going to Stefanescu Horatiu. I thank Horatiu in allowing me to feature his work on my blog. →STR PY + →STR ")"
Set your calculator the folder PATRULATERDIAGONALE. Run STARTDIAGONALE and enter the coordinates. The rest of the program runs automatically. Start with the left hand corner and go clockwise. Note: I typed Horatiu's program on an HP 49G. In REZULTATE, for some reason I couldn't get the FIX 4 to take effect, even when I switched the calculator to Approximate mode. So in order to get both PX and PY on the screen, I added a carriage return character (↲, [right shift] [ 2 ]) after the semicolon. This creates a new line allowing both coordinates to be displayed. Horatiu, Stefanescu "Calculul Coordonatelor Punctului de Intersectie A Diagonalelor Unui Partulater Oarecare" 2018. **Thank you Mark Hardman for pointing out my error (on minute). The sentence is now correct. The video also explained that are calculator clubs in Japanese high schools that practice calculator speed typing for seven hours on Saturdays and Sundays. 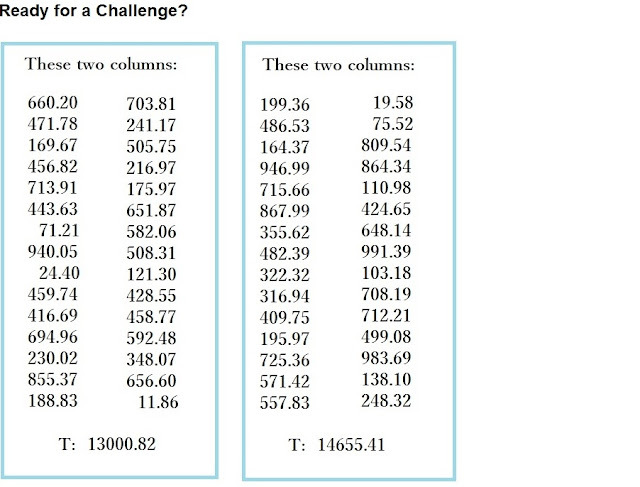 There are also calculator speed contests in Japan. If anyone reading this has the link or information for the 2018 or even the upcoming 2019 contest, please let me know. Thumb works on the 0 key only. The index finger covers the 1-4-7 keys, along with the 00 and any keys on the left side of the keyboard. The middle finger covers the decimal point, and the row with the 2-5-8 keys. The ring finger covers the 3-6-9 row, along with the subtraction, multiplication, and division keys. The ring finger also has the equals key. Finally, little finger is for the plus key. Regarding the setup and the keys on the calculator, your mileage may vary. The setup present for right-hand users, hence for left-handed users will have to adjust accordingly (thumb works on the plus key, index works with 3-6-9, middle has 2-5-8, ring has 1-4-7, and little has the 0 key for left-handed users). 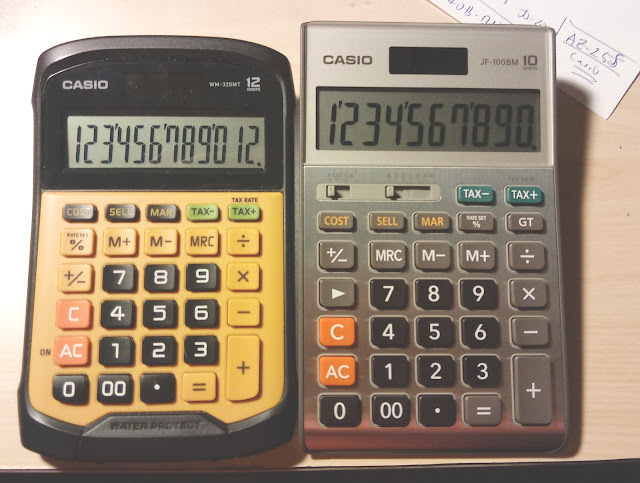 The calculator shown in the video is a Casio ND-26S (0:45). It is a Japanese model, also designated as a "Study Cal". Also featured is the Casio AZ-25S (3:33), a "Study Cal". According to Casio, "Study Cal" are sold to schools only. 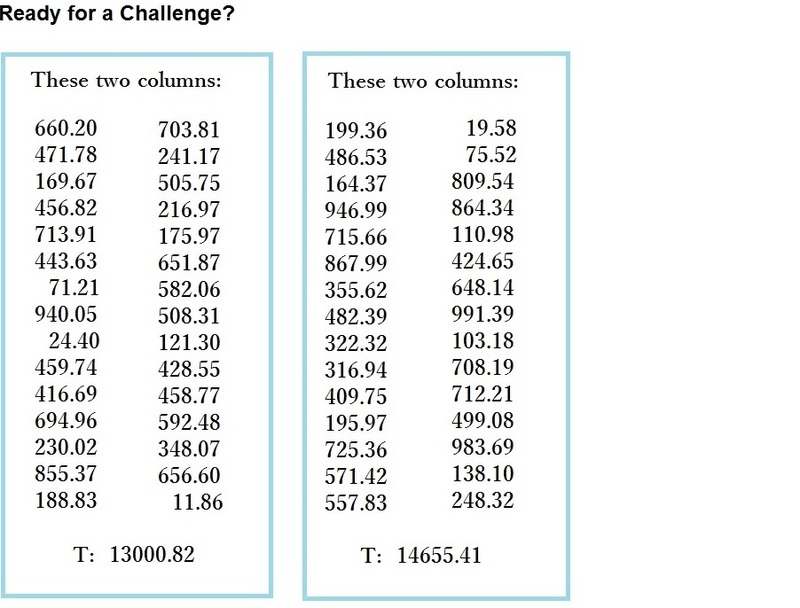 Try adding the columns as fast and accurately as you can. For me, it currently takes me about a 1:20 to add up the 40 numbers in each of the blue boxes on my left hand (my non-dominate hand, I'm normally right-handed). This is after 30 minutes of practice. This segment is part of the Japanology series. This particular episode was aired on June 13, 2013. The program STRNAMES allows the user to store a list of names in a single string. There are only 10 string variables for the TI-84 Plus CE (and in fact, all the the TI-83 and TI-84 families), so if you need to store more than 10 names, a workaround is needed. This program uses two strings: Str1 and Str2. Str1 is a temporary string variable used to store and edit the list of names. Str2 is the master list of all the names. In order to make this work, we will need to note where in the string the names start and the length of the names. The two lists used are L₁, the position of each name, and L₂ for the length of each name. In this program, each name is separated by space. You will notice that Str2 starts with a space, and the lists L₁ and L₂ have a 0. The TI-84 Plus CE does not allow us to store empty strings or lists. 3. Clear/Initialize: Clears all the variables. I recommend you start with this option every time you work with a new list of names. Also, if you use other programs or the list or strings for other things, run the Clear/Initialize before beginning. 4. Review: List all the names in order. 5. Erase Any Name: You can erase any name in the list (1st name, 2nd name, 3rd name, etc). Try playing with this program. 1. Start by initializing, choose option 3. 2. Enter EDDIE. Choose option 1. Press [ 2nd ] [alpha] and type EDDIE. Quotes are not needed (since the Input command will be stored to a string). Str2 = " EDDIE "
3. Enter ANN. Choose option 1. Str2 = " EDDIE ANN "
4. Enter TERRY. Choose option 1. Str2 = " EDDIE ANN TERRY "
5. Let's remove ANN from the list. In our example, ANN is the second name. Choose option 5. Enter 2. The result, Str2 = " EDDIE TERRY "
6. Enter MARK. Choose option 1. Str2 = " EDDIE TERRY MARK "
Continue with the example however you want. The program PRECESS estimate the new position (right ascension (RA), declination (δ)) of a celestial object given their position in Epoch 2000 with the object’s proper notion. The key codes for both calculators are the same. R4: number of years from 2000. For 2022, store 22. For 1978, store -22. * The borrower's monthly non-property related debt (credit cards, auto loans, store bought appliances on credit, etc). Do not include utilities or phone bills. * The estimated monthly property tax and insurance. For this program, combine the two amounts. The down payment is not taken into consideration. 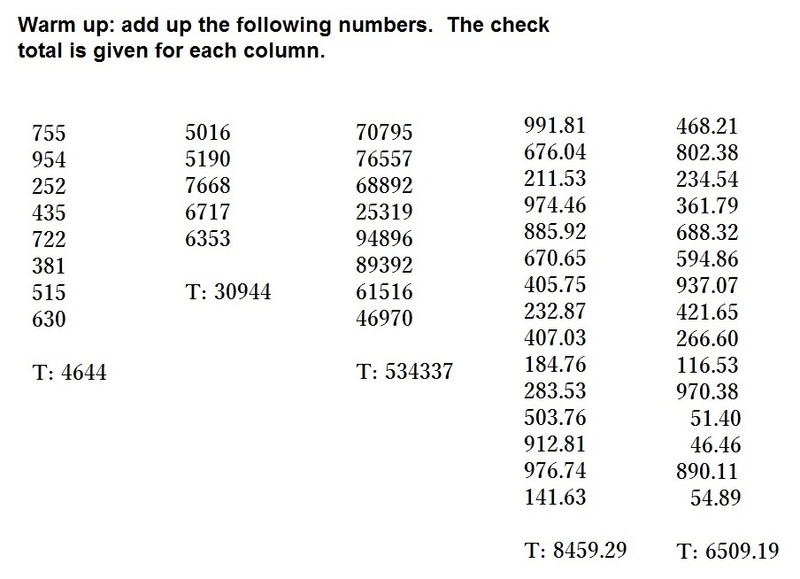 The result is the loan amount using the standard 28:36 ratio (stored in register R5). The 28:36 ratio is the guideline that the borrower spends no more than 28% of their income on housing expenses, and no more than 36% of their income on all debt service. The key codes for most steps are the same. 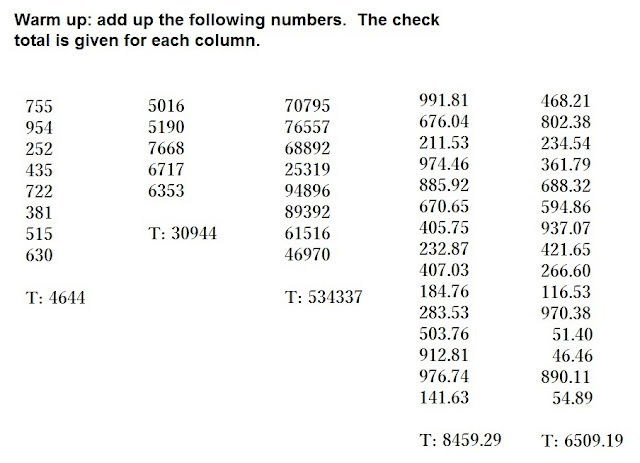 Lines where the key codes are different are noted, particularly the percentage function. * The vehicle is assumed to be a passenger vehicle. * The reaction time is 1 second and the deceleration rate is 28 ft/s. The program listed rounds all results to one decimal place. The key codes for both calculators are the same in this program. The following program will allow the user to round any positive number to any number of decimal places, regardless of fixed decimal settings. Key codes for both calculators are the same. Example 1: Round π to 4 places. Note: I typed this blog entry by using the Jarte word processor (http://www.jarte.com/index.html). I am using the free version for the first time (there is also a paid version). Jarte is based off of WordPad, but adds spell check and nicer editing features. 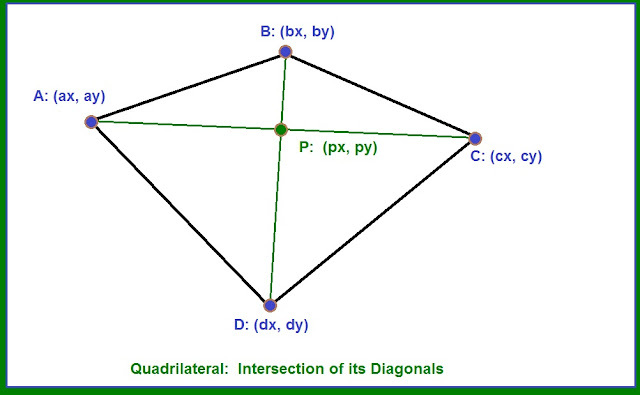 Store the lengths of the triangle in registers R0, R1, and R2 respectively. Note: I switched computers last week. For the last few years, I used Microsoft Word but for the time being I am going to use WordPad. Let's see how this goes. Fortunately I can still can use Unicode characters with Alt+X. For example, I can type 221A, then type [Alt] + [ X ] to get the square root character. Unfortunately, WordPad doesn't have spell check. The Qualifier Plus IIImx is a finance calculator that seems to be made for a specific client, World Savings. The model has a World Savings logo on it, and any Armadillo Gear protective cover that came with it. * Date calculations: 2-digit year entry. I’m not sure what this time period covers because the pocket guide doesn’t state. Through entering various dates and using www.dayoftheweek.org, the dates seem to range from January 1, 1960 (Friday) to December 31, 2059 (Wednesday). One neat thing with the Qualifier Plus IIImx (this really goes for all the Calculated Industries financial and real estate calculators) is that some of the entries can determine percentage rates or dollar amounts without additional key strokes. Generally, any entry of 100 or less is treated as a percent, above 100 is treated as dollars. I am grateful that when I bought the calculator it still had its pocket reference guide [[S2]] otherwise I would have no idea what all the MARM keys were about. I still don’t understand all the details, but the MARM keys calculates such loans that were called “pick-a-payment” loans, which were popular and heavily advertised during the housing boom in the mid to late 2000s. In general, “pick-a-payment” loans allowed borrowers to set a payment where the payment is less than the interest charged for the initial period of the loan. Any interest that wasn’t paid was tacked to the end the loan. Furthermore, none of the principal has been paid down during the initial time. I think you can see the problem, by paying too low in the beginning resulted in a higher loan balance (principal plus unpaid interest). Furthermore, MARM loans are rate adjustable. Even with the presence of caps, it’s not all that comforting when the deferred interested and delay of paying off principal are taken into account. It shouldn’t be surprising to see why Calculated Industries discontinued this model and took down any documentation for this calculator. My personal take: if the mortgage or loan has any hint of negative amortization – RUN! Don’t even consider it. Because of the controversial and perhaps infamous nature of some of this calculator’s features, I am not going to issue a verdict or recommendation. [[S2]] Calculated Industries. Model 3440: Pocket Reference Guide. 2004 Guide is not available online. [[S3]] Orlofsky, Steve – Editor. “Wells Fargo to settle lawsuit over pick-a-payment loans” Reuters. December 14, 2010. https://www.reuters.com/article/wellsfargo-settlement/wells-fargo-to-settle-lawsuit-over-pick-a-payment-loans-idUSN1427719820101215?feedType=RSS Retrieved September 5, 2018. [[S4]] Reckard, E. Scott. “Wells Fargo settlement over ‘pick-a-pay’ home loans is challenged”. Los Angeles Times. December 11, 2012. http://articles.latimes.com/2012/dec/11/business/la-fi-wells-suit-20121211 Retrieved September 9, 2018.